If you answer ‘yes” to any of these questions, you may be at greater risk from sleep apnea. Does anyone else in your family have a history of snoring and sleep apnea. Have you suffered a stroke or heart attack disease? Normally, the muscles that control the upper airway relax during sleep. 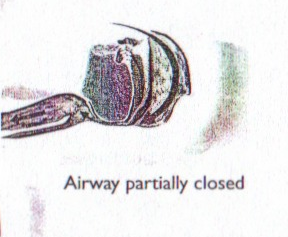 If they relax too much, the upper airway becomes narrow and some people begin to snore. 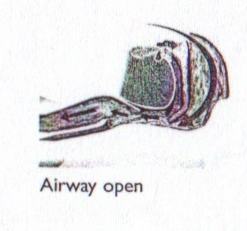 If the airway becomes too narrow, this may cause breathing difficulties, Sometimes, the airway becomes completely blocked and the person temporarily stops breathing, experiencing an ‘obstructive apnea.” This can last for ten seconds or more, it may happen frequently—even several hundred times a night. If you have this condition, every time an apnea occurs, you struggle to breathe, placing stress on your brain and heart. Night after night, your sleep is disrupted. You experience the kind of tiredness that affects the quality of your life, work, and relationships. Your partner may hear the tell-tale signs of sleep apnea while you sleep—snoring followed by a period of silence, and then, perhaps, a loud snort or a gasp as you resume breathing. Recent research shows that snoring and sleep apnea are associated with many serious conditions. Left untreated, they are a contributed risk factor in high blood pressure, heart disease, stroke, diabetes, and depression. More than 35% people with sleep apnea suffer from high blood pressure, increasing their risk of heart disease. Significantly, 83% people who continue to suffer from high blood pressure despite taking three or more drugs, also have a sleep apnea. Almost 70% of people who have stroke have sleep apnea. Can this be treated? How? 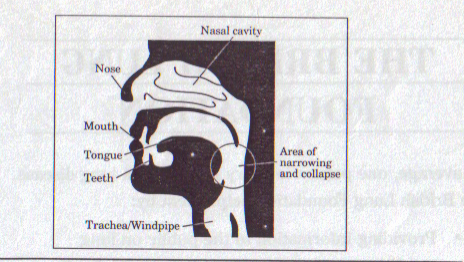 When sleep apnoea and snoring are not severe then simple approaches can help. Losing some weight, not drinking alcohol after 6.00 pm (alcohol relaxes the upper airway muscles even more), keeping the nose as clear as possible, and sleeping on one’s side or semi-propped up can all help. When snoring is very objectionable, with the individual and his or her partner desperate for a solution, then an operation on the back of the throat may help — but this is a last resort and should only be done when a sleep study has shown snoring alone with very little or no, sleep apnoea. The only really effective treatment currently used for bad sleep apnoea is nasal continuous positive airway pressure (nasal CPAP). 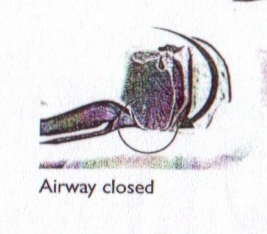 Because the inside of the throat narrows, it can be held open by slightly pressurized air To deliver this sir a mask is worn during sleep just over the nose and connected to a small, quiet pump beside the bed Breathing is then able to return to normal during sleep with the air gently blowing through the nose, holding open the throat. This treatment doesn’t involve drugs or surgery and helps hundreds and thousands of people all over the world to enjoy healthier sleep and a healthier life. Do you think you might have a sleep apnea? Take the Epworth sleepiness test consult your physician. 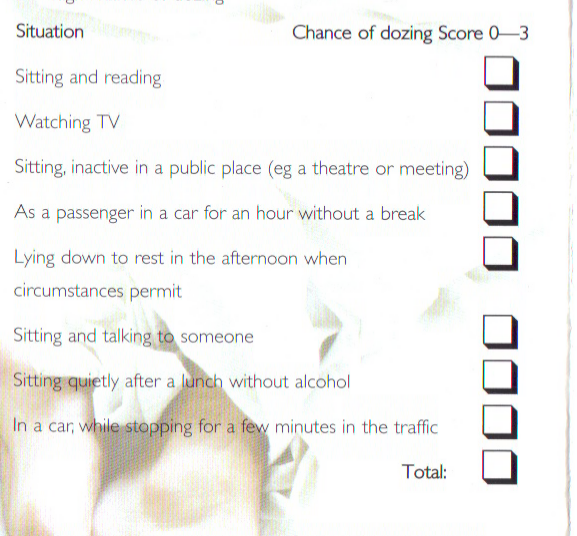 How likely are you to doze off or fall asleep in the following situations, in contrast feeling just tired? This refers to your usual way of life in recent times. The higher the score, the greater the chances of diagnosis of Sleep Apnea. This test is not a substitute for professional medical diagnosis and treatment management –if you have any concerns regarding your health, do seek professional medical advice.